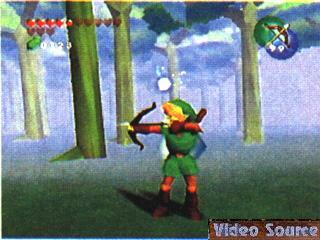 The words Zelda and with it Ocarina of Time ring a bell to almost every gamer. Zelda, Shigeru Miyamoto's creation has become a legend by now. 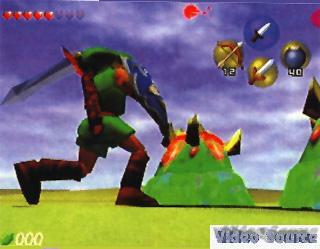 Ocarina of Time made an impact in the game industry and it surely earned it. Shigeru Miyamoto seems to want the players to feel like they're in the game itself, standing in a cold cave, smelling the fresh grass of Hyrule Field, feeling the heat of Volvagia's burning breath, everything. Now you're probably wondering what my opinions on the new Zelda for the game cube is. Well at first I was very shocked at the dramatic change from a dark realistic Zelda to a cartoonist cell shaded Zelda. 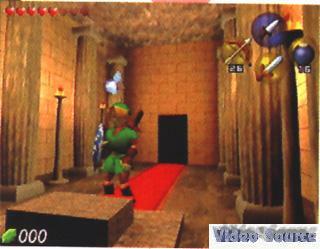 But we must remember that the first pictures of Oricaina of time were not the great either. And we cannot judge a game by a minute of footage. Here are some of the first pictures of Oricania of time.